Sensor technology, with what is claimed to be the industry’s lowest power Bluetooth Low Energy radio are combined in the RSL10 sensor development kit from ON Semiconductor. The sensor development kit brings together the RSL10 system in package (SiP) with a range of advanced low power sensors from Bosch Sensortec to provide nine degrees of freedom (DoF) detection and environmental monitoring, including ambient light, volatile organic compounds (VOC), pressure, relative humidity and temperature. A low noise, digital microphone is also included, along with a user-programmable RGB LED, three programmable push-button switches, and 64kbit EEPROM. The sensors are Bosch Sensortec’s integrated BME680 environmental sensor which detect a range of gases for air quality applications, its BMM150 geomagnetic sensor and the BHI160 smart sensor for high accuracy motion sensing. The RSL10 sensor kit combines motion and environmental sensing with the low power capabilities of the Bluetooth 5-certified RSL10, targeting both consumer and industrial IoT applications. Developers can use the RSL10 Sense and Control mobile application to connect to the RSL10 sensor development kit to monitor sensors and to evaluate the kit’s features. The app also supports multiple commercial cloud platforms for uploading sensor data. The RSL10 sensor development kit is available now. 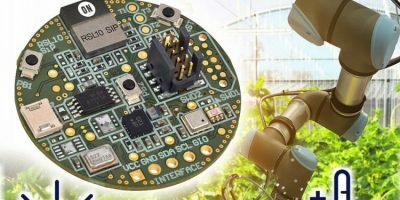 ON Semiconductor’s other energy-efficient, rapid prototyping platforms for IoT include the Bluetooth IoT development kit and the recently-introduced energy harvesting Bluetooth low energy switch. The RSL10 is available in a 5.5mm2 WLCSP, a 6.0 x 6.0mm QFN package, and a complete SiP with an integrated antenna. ON Semiconductor will host a live demonstration of how service-provider companies can use the RSL10 sensor development kit to monitor worker safety at Embedded World (Nuremberg, Germany (26 to 28 February) at the company’s stand in Hall 4A – 260. ON Semiconductor supplies energy-efficient, power management, analogue, sensors, logic, timing, connectivity, discrete, SoC and custom devices for automotive, communications, computing, consumer, industrial, medical, aerospace and defence applications.